Newcom Tavern is the oldest building still standing Dayton (1796). 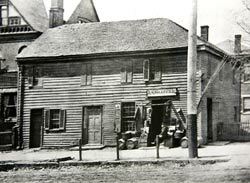 Newcom Tavern was originally located on the southwest corner of Main Street and what is today Monument Avenue. The building now stands in much the same condition as it was originally, at Carillon Historical Park. 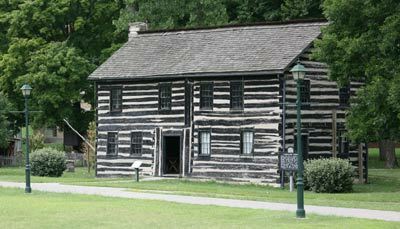 Robert Edgar built this two story log house for Col. George Newcom and his family. Robert Edgar was a millwright that George Newcom hired to build "the best house in Dayton." It later housed Dayton's first court sessions, church services and council meetings. Travelers could also find food and lodging under its roof. The original house consisted of one room upstairs and one room on the ground floor, with a door facing the river. In 1798, a two-story addition was added south of the original structure, with a new door facing Main Street. George Newcom was a veteran of General Anthony Wayne's campaign against the Indians and led one of three groups of original settlers that headed north from Cincinnati to Dayton in 1796. He and his wife, the former Mary Henderson, chose lot #13 on which to build their new home. In 1800, Mary gave birth to one of the first white children born in Dayton, their daughter Jane. The Newcoms sold the tavern in 1815 and over the next 20 years ownership changed several times. In 1838, Joseph Shaffer purchased the structure at a Sheriff's auction and converted it into a general store. The building remained "Shaffer's Store" for the next 56 years. In 1894, architect Charles Insco Williams started to raze the structure to make way for an apartment building. However, as the clapboards were removed, the original log structure was revealed. John Cotterill owned the building and offered to donate it to the city, provided it was moved from the property. Acting on the recommendations of the "Log Cabin Committee," the city approved moving the tavern to Van Cleve Park. John H. Patterson, founder of The National Cash Register Company, paid for the move. The Daughters of the American Revolution raised money by public subscription to have it restored, and the Dayton Historical Society was organized to operate it as a museum. In the 1960s, the Montgomery Historical Society donated the tavern and related collections to Carillon Historical Park. Newcom Tavern made its final move in the fall of 1964. 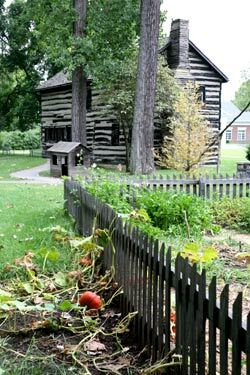 Today, now Dayton's oldest standing building, Newcom Tavern stands in Carillon Historical Park, approximately 2 miles south of its original site. Newcom Tavern was restored in 1896 to celebrate Dayton's centennial. It was dedicated in Carillon Park in 1965. Carillon Historical Park features over 25 exhibit buildings and structures that celebrate the history of the Dayton, Ohio area.